Have You Optimized Your LinkedIn Profile? Marketing yourself and networking is one aspect of ghost writing you can’t afford to overlook. LinkedIn needs to be a part of your marketing and networking strategy. I set up my LinkedIn profile several years ago. I’ve only revisited it twice (today being one of those days). A great article on BNET yesterday sent me to my LinkedIn account to see if my summary measured up. I thought, it didn’t look too bad, though I decided to streamline it a little based on Jeff Haden’s recommendations. I eliminated some unnecessary information so the summary was more like an elevator pitch. I wrote in the first person. I streamlined the keywords I used. I tightened up the two to three paragraphs adding bullet points to make it easier to scan. Then I read it through and revised again. Jeff Haden included five examples in his post. On the very first example I saw something that had nothing to do with writing. Yet, it was something so vital I had to take immediate action. It had to do with the order of the additional information modules LinkedIn allows me to add after LinkedIn’s opening module. Guess where my summary was. It was at the bottom below the experience and additional information modules. Not good! Arrange your LinkedIn profile like a resume-most important information first! I write resumes, so there is no excuse. When you look at your LinkedIn page, you need to look at through the eyes of an HR person. Where would you put a summary on a resume? At the top. So that’s where it should be on your LinkedIn profile. Place it as high on the page as LinkedIn allows. Next, put your experience. As you fill out this section, continue to use the first person. This is your opportunity to create a picture of how you do your work and how you benefit those you work for. Unlike a resume, you don’t have to go 10 or more years back. I begin my experience with the earliest position pertinent to what I am doing today. That’s seven years back. Anything further back doesn’t enhance my profile, so I’m not including it. I’ve placed my education module next. This is an essential module. Yet, it isn’t as important as my experience. In other situations, placing education between the summary and experience could be a good move. For example, a professional’s credentials might be the next thing an HR person would want to see before they checked into the experience. Also a new graduate can use the education module to highlight courses taken using the “add activities and societies” feature. This information can break the ice when the experience section is weak. For my profile, I have chosen to put the recommendations below Education, because LinkedIn already includes links to the recommendations within each position. You might prefer to put them higher, depending upon how impressive your experience is. LinkedIn allows you to add additional modules as well. I’ve added WordPress so my blog posts appear on my profile and my homepage. You can also add Tweets, SlideShare, Google Presentations, Box.net, etc. LinkedIn adds new applications so its a good idea to revisit this section. I discovered a new one called Behance Network that will allow me to add a portfolio of my work on LinkedIn. Because I’m working in a creative field this is a real asset. Now someone who finds me on linked in can view examples of my work without having to go to my website. And guess what. This doesn’t water down my own site’s SEO. Additional information is an optional section. That’s why it’s the one of the last modules on my LinkedIn profile. It probably doesn’t matter which order you use to arrange your personal information or contact settings. I’ve chosen to place the contact settings above applications. It could just as well remain toward the bottom if your website is well optimized. If someone is searching for an individual with your skills, your website is as logical a place to contact you from as LinkedIn. Remember, look at your page as though you were someone deciding whether you are the right person for their job. While everyone prioritizes information differently, there are general trends. A brief, well-written overview can draw your reader into wanting more. That’s reason enough to keep that kind of information at the top of your LinkedIn profile page. Thanks for the tips! 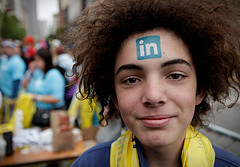 Since LinkedIn is still considered kind of “new”, many job seekers seem to think that simply having a profile is enough. As an employer, I look at any prospect’s LinkedIn profile in addition to their other job search documents. One of my employees recently told me about how her landlord evaluated her based on her LinkedIn!